I can’t help but smile every time I think about how Apple Watch has helped me over the past year. I’m healthier, more aware, and I can communicate easily, all using one device strapped to my wrist. More than 70 diamond-grit CNC cutters machine every Apple Watch Edition case—a process that takes up to six hours. Each case then undergoes two hours of polishing to increase strength and achieve its characteristic pearl-like finish. I want this ceramic watch as much as I wanted the black iPhone—it’s gorgeous. There are a couple of features of Apple Watch Series 2 that I was immediately interested in: GPS and using AirPods during my exercise. Both of these mean I don’t need to take my iPhone with me on my daily walk, which has given me a strange sense of freedom. As I said in my iPhone 7 review, I didn’t use Bluetooth headphones before because every one I tried was horrible. This meant I needed to bring my iPhone to listen to music. 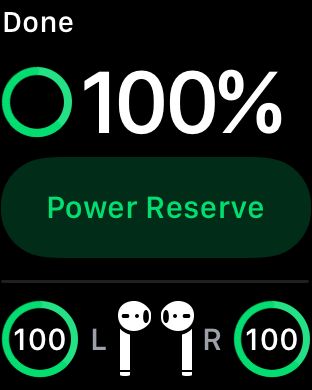 The AirPods changed all that, allowing me to listen to a playlist on my watch and still have quality sound. 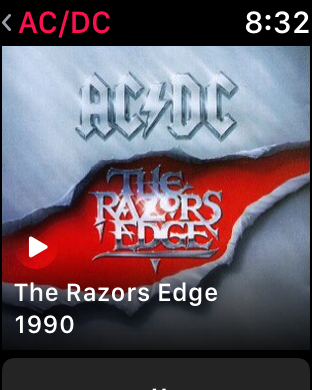 It seems odd to me that you can only shuffle songs when viewing the songs screen on your watch. If you’re in the Artist, Album, or Playlist screen you get to choose the source or Library view. Not a big deal, just weird. Double-tapping on the AirPods allow you to play/pause the music, which is very handy. 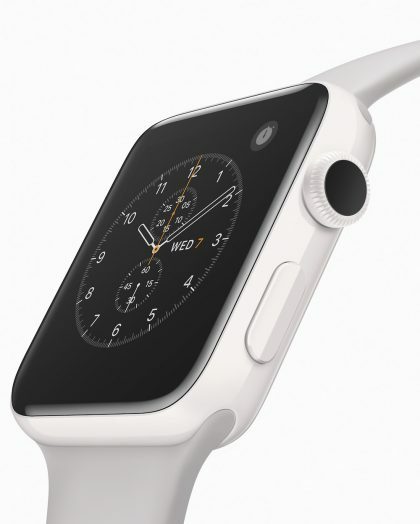 Unlike the iPhone, you can’t change the double-tap to control Siri on the watch. Of course, having the phone with you also means you’re still available. I want my walk to be about my walk—nothing else. It’s easy to turn on Airplane Mode, but I always worry that I’m missing something at work, so I don’t bother turning that on. Without the phone in my pocket, I’m free to enjoy the music and a peaceful bit of exercise. Having GPS allows the watch to sync my walk location to my iPhone. This gives me a map in the workout section of my daily activity, which not only shows where I walked, but also how I did. If you look at the map, you can see it’s colored. Yellow is the average pace for this particular walk; Green is above the average pace; and Red is below the average pace. This is tremendous information to have. I can look at my week’s walk and see where I am slowing down and try to figure out why. Is it the area? Traffic? To my surprise, my second mile is always faster than my first mile. Maybe I don’t need to figure out why, but I still like to have the information. GPS is also available to a new set of exercise routines for swimmers. I know how to swim, but I don’t do it in my exercise routine. Apple Watch Series 2 is water resistant to 50 meters, the industry standard for swimmers. The swim workout can count laps, track average lap pace, and auto-detect stroke type to accurately measure active calorie burn. That, folks, is wonderful attention to detail. That has Apple written all over it. The attention to detail doesn’t stop there. The other feature they added for swimmers has to be the coolest feature of all. When you swim, there is a good chance that the water will hit the screen causing accidental taps. 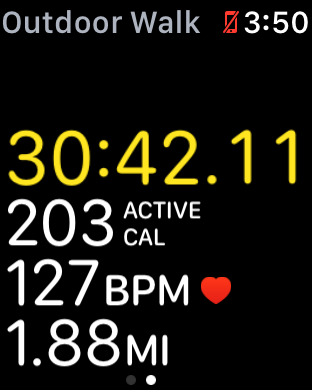 However, when you start a swim workout, Apple Watch auto locks the screen to prevent accidental taps. When you are done the workout, just turn the digital crown and the screen will become active again. There is one other problem Apple had to solve, and they did so brilliantly. Apple Watch has a speaker and in order for the speaker to work, it needs air. Apple allows water into the speaker cavity, but when you turn the digital crown at the end of your workout, it activates the speaker vibration to push water out of the cavity. It’s an amazing solution to the problem. For me, Apple Watch is all about information. My screen is set to the activity rings, so I see all day how I’m doing. That’s important to me. When I first started using the watch, I was obsessed with closing all of the rings, but that’s changed a bit for me. Now I just want the information about how I’m doing. I understand that there are consequences for not doing my exercise or for not moving as much as I did the day before. If the rings are hidden, I may not look at it on days that are really busy, but having it front and center means I see it all the time. I don’t want those reminders that some apps give you to get out and walk—I just want the information. I’ll make the decision to exercise on my own. Important information isn’t just about fitness or closing rings. It’s whatever information is important to you—texts, emails, or other notifications that pop up on your screen. This is where the Apple Watch becomes such a personal device. What’s important to me may not be important to you. That doesn’t matter though because the watch is so versatile, it can be a companion to both of us in different ways. I use my iPhone differently because of my watch, and that will continue to happen thanks to GPS and AirPods. I’m already using it differently in the past week of using Apple Watch Series 2. We all know that performance was an issue with the first Apple Watch. I would tap on the rings and the watch would think so long about whether to open or not that I’d just give up. That’s no longer the issue it was. If you are opening an app for the first time, it will take a few seconds to open—certainly not as long as it did before, but it won’t be instant. Once an app is open, returning to it will be almost instantaneous. This is fine for me because I don’t actually use that many apps on my phone. Music, Fitness, Workouts, Weather, Maps, all kinds of notifications, and Messages—things like that are main watch apps. I put my watch on first thing in the morning and take it off when I go to bed at night. I’ve ever run out of battery on my old or new watch when I keep this routine. I always have plenty of battery left at the end of the day, even with GPS workouts running and listening to music on the AirPods. I think Apple had a lot of battery power to play with when they added these new features, but it appears they are still using it wisely. Apple says the Apple Watch Series 2 display is two times brighter than the previous version. I know this: when I go outside, I can now see the display perfect, even in sunlight. I’m not sure what the specs are on that, but I know it works much better.